A separatist calling himself a “sovereign Hebrew Israelite citizen” bit off the end of a Knoxville Police Department officer’s thumb during a fight on Wednesday afternoon, police said. KPD Officer Trey Lane was in surgery for his thumb as of 4:30 p.m., according to a police news release. A second officer, Tim Edwards, was taken to a hospital with a leg injury following the fight. Alexander Ray Johnson, 29, of Knoxville, was driving an Acura MDX on Woodbine Avenue just after 1:15 p.m. when the officers pulled him over at Milligan Street for speeding, according to the release. 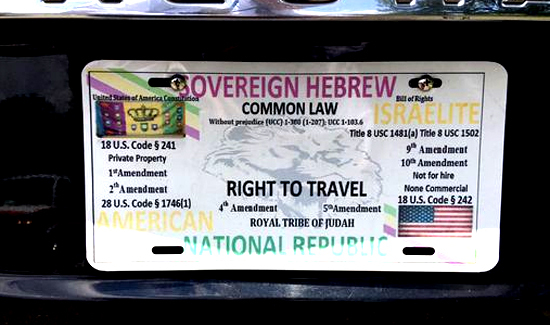 The car had no legal license plate — only a “Sovereign Hebrew” plate that purported to be issued by the “Royal Tribe of Judah,” police said. When the officers began arresting Johnson, he allegedly resisted and bit off the end of Lane’s thumb. Johnson, who was not injured in the fight, was arrested and is being held in the Roger D. Wilson Detention Facility on traffic charges. He will be charged this evening with aggravated assault and resisting arrest. A woman in the car was detained for questioning and is expected to be released. Sovereign citizens reject federal, state and local laws and typically deny the legitimacy of government agencies, including local police departments. They often refuse to pay taxes and issue their own versions of driver’s licenses and other documents. In February, a grand jury in Davidson County indicted 10 self-proclaimed sovereign citizens on charges of filing fraudulent liens against city and county mayors, police officers, deputies and other government officials. Those bogus claims totaled more than $2 billion, according to the Tennessee Secretary of State’s Office. Also in February, another sovereign citizen, Lee Cromwell, was convicted on one count of vehicular homicide and eight counts of aggravated assault for driving a truck into a crowd gathered to watch fireworks at A.K. Bissell Park in Oak Ridge on July 4, 2015.